Lately I've been exploring daiquiris and rums like a drunken sailor. I go through these phases occasionally, for no particular reason I just get into a particular flavor or liquor and explore it until I get intrigued by something else. 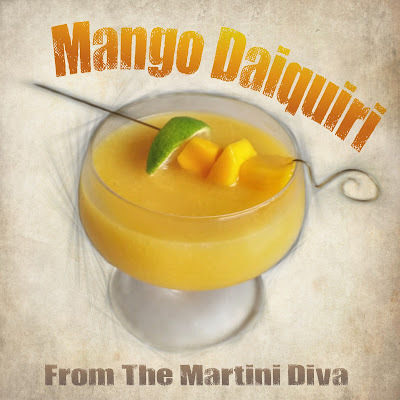 Recently I've done a duo of Coconut Daiquiris, a Golden Kiwi Daiquiri infused with lavender, explored a version of the the Hemingway Daiquiris then just did a Spiced Banana Daiquiri which also uses the spiced Sailor Jerry Rum I included in this Mango Daiquiri. Experimentation is a big part of my whole cocktail philosophy and part of what makes it so much fun. Earlier this summer I was going down the Mojito road (Chipotle Watermelon, Cherry Basil, Grilled Pineapple, Cucumber and Pea Shoot and even a Grapeful Dead Mojito last Halloween.) I'm always obsessed with something in the alcoholic beverage department. As you can see, there are unlimited ways you can combine your love of fruits, veggies, spices, herbs and alcohol, whatever they are. This just happens to be my Rum Period and whatever fruit comes my way has ended up with a rum. The other day a couple of ripe mangoes landed in my lap, and, never having liked mangoes much before, I realized that the riper they are the more I like them and in they went into my blender with some of the spiced Sailor Jerry and a new rum I just bought, Flor de Cana, a 4 Year Old Extra Dry white rum. Using the two different rums, one with spices, and those mangoes almost took this cocktail to the Tiki category except I didn't give in to my urge to remove it from the daiquiri family by adding orgeat or falernum! GARNISHES: Fresh mango cubes, Lime slice. DIRECTIONS: Chill your glass in the freezer. Add the rums, mango, lime juice, simple syrup and ice cubes to your blender and pulse until smooth. Pour into your chilled glass, tap in the cardamom bitters, then add your garnishes and enjoy.